In the past weeks, I've participated in blog hops and have enjoyed it (more than I thought I would, actually). I've seen its benefits and so I've decided to initiate one myself! I hope a lot of you will participate and have fun! Let's start threading through one blog after another! 1. Be a follower on Catharsis, but only if you genuinely enjoy what you see on here. Please leave me comments too so I know where to visit you! 3. Check out the other blogs listed on this blog hop and remember to leave comments so they can possibly follow you back. If you don't know where to start, checking out the ones before and after you on the list is always a good start. 4. 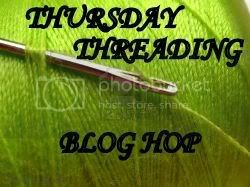 Copy and paste the Thursday Threading Blog Hop button above and paste it on your blog so that more people can participate. Again, this is optional. Thank you for hosting. I have added your button to the blog hop library on my page. Hi, I just landed here from The Adventures of JMan and Miller bug Finding New Friends Weekend Blog Hop. I'm a brand new follower. I appreciate all comments and follows and would be more than happy to return the favor. My blog is about art, photography, quotes and inspiration. I'd love for you to drop by. Thanks for hosting this blog hop and reading my blog yesterday. Thanks for linking up to my hot on tawnasplan.com I linked up to yours too, just a day late! Thanks for stopping by and sharing your thoughts on Balance & Burnout at Create With Joy this week! I tried to join the hop but it currently isn't taking my link so you may or may not see me on your list. Regardless, I am a new GFC follower and I hope you'll join me and become a regular participant in our weekly discussions! I just passed by to say Hi.Thanks hosting and hope you good.Meanwhile plz do visit my page read on freeing your mind and 5 steps to freeing your mind and comment to assist improve and share my works.